That’s rather meta. A hack showing another hack. Poetic justice? It would be interesting to see if the resolution could be pushed up a bit. I wonder how using something Autotrace to convert the photo to a contour map and then selectively discarding contours for the lighter parts of the image would work. 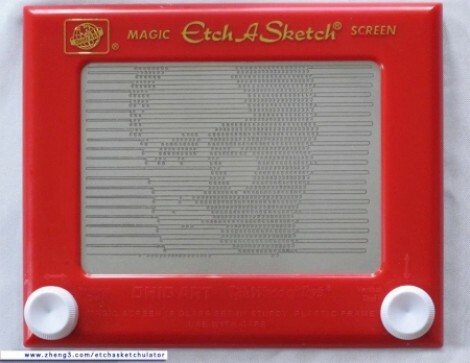 This satisfies some of my recent desire for servo driven etch-a-sketching. It’d be cool if the scripts and code were available. The fly in the ointment is the control algorithm. This is a lot more difficult than your usual raster-to-vector conversion, because in this case, you can’t pick up of the stylus at any time. Ha! i guessed mitt too but i think it would be hard for somebody outside the us to guess, if he wins in 2012 elections it would become easier but untill then ill be surprice if non americans know who he is.